I have a suckling pig in my refrigerator. Over the next three days I’ll narrate his transformation from corpse to recipe to Christmas dinner. Along the way I’ll offer words from the dead and the living, write of rituals that bond family and also offer ways I purify, I atone–a personal journey into a roasting pan, the underworld, and a new cycle of the earth round the sun. Let’s begin the begin. Dig under volcanic ash at Pompeii and you discover the fresco of a pig being led to sacrifice. Shedding of blood, offering of flesh binds heaven and earth together; this ancient ritual speaks to us out of the past, speaks for the dead who found the sacred and profane in Sus scrofa domesticus. 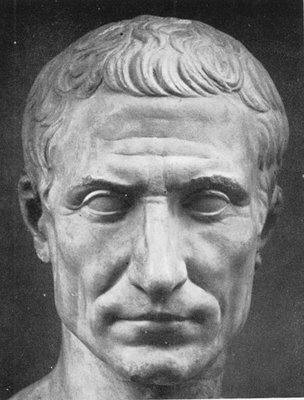 Varro sides with Pompey in the Roman Civil Wars, finds himself on the losing side but receives a pardon from Julius Caesar, only to be proscribed by Marc Antony, and then finally regain station and peace under Augustus. His writings on country affairs display the mind of a farmer attuned to the deeper meanings of soil and husbandry, meanings that have much to do with what is beneath the furrow. Carrying suckling pigs begins a ritual emphasizing a connection between what we grow, what we raise, and our life, our own death. These beliefs of an agricultural society have no division between what is killed for the gods and what is eaten by mortals. Fat around a bone in fire may satisfy immortals, while hunched around a fire worshippers eat flesh; the same animal satisfies those above and below. 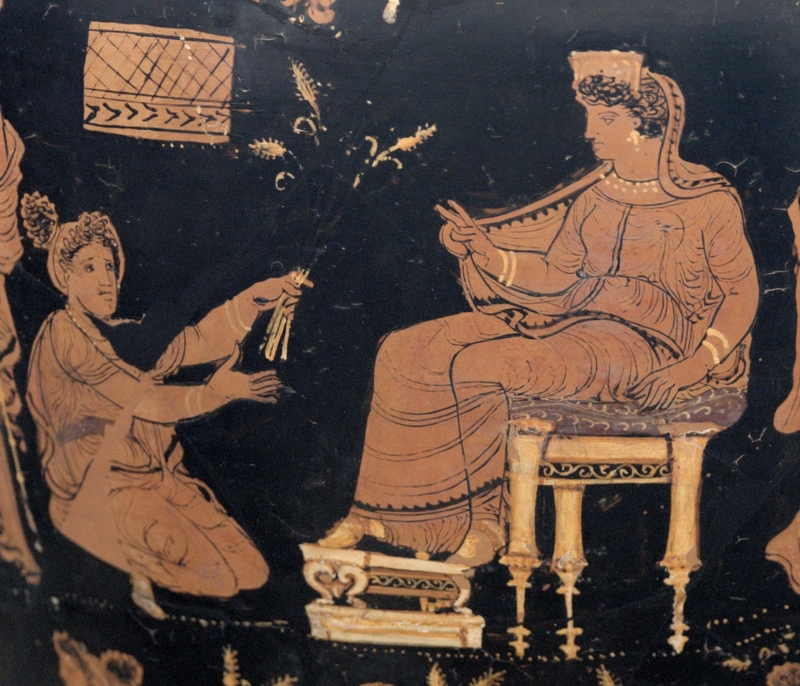 The Varresse painter of the 4th century BCE fashions Demeter and Queen Metanira of Eleusis. Offerings of wheat underscores this agricultural nature of the the story of Demeter and Persephone. Clement of Alexandria, a 2nd century CE Christian, records the password for the initiates into the mysteries. I fasted, I drank from the kykeōn, took out the kistê, worked placed back in the basket and from the basket into the kistê. The kykeōn could be barley, water and pennyroyal (a flowering plant) or wine and grated goat cheese. The kistê was a round box tied with purple ribbons. What does this have to do with the story? Demeter wanders the earth looking for her abducted daughter Persephone, discovers that Zeus has married her off to the god of the underworld, walks to Eleusis, sits by the Well of Maidens and asks for a kykeōn. What does this password have to do with Demeter placing the Queen of Eleusis’ son in a fire to turn him from human to god, only to be prevented from this ascension by his mother. What does this have to do with a pomegranate seed? Eliade offers one proposal. But what of the pig? 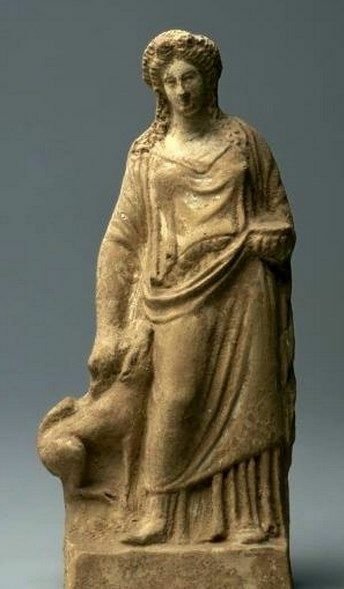 Passing next to the corn-goddess Demeter, and remembering that in European folk-lore the pig is a common embodiment of the corn-spirit, we may now ask whether the pig, which was so closely associated with Demeter, may not have been originally the goddess herself in animal form. The pig was sacred to her; in art she was portrayed carrying or accompanied by a pig; and the pig was regularly sacrificed in her mysteries, the reason assigned being that the pig injures the corn and is therefore an enemy of the goddess. But after an animal has been conceived as a god, or a god as an animal, it sometimes happens, as we have seen, that the god sloughs off his animal form and becomes purely anthropomorphic; and that then the animal, which at first had been slain in the character of the god, comes to be viewed as a victim offered to the god on the ground of its hostility to the deity; in short, the god is sacrificed to himself on the ground that he is his own enemy. Treaties, marriage, mysteries, death, life, and self-sacrifice. Demeter carries her enemy by her side, identifies with its bristles and hooves, because though she scatters life around the world, she also roots it up, she also injures the young, and so must acknowledge death within her and offer it to life. Which brings us to another quote from Varro. And here we go, from sacrifice to banquet. From knife and altar, to knife and carving platter. 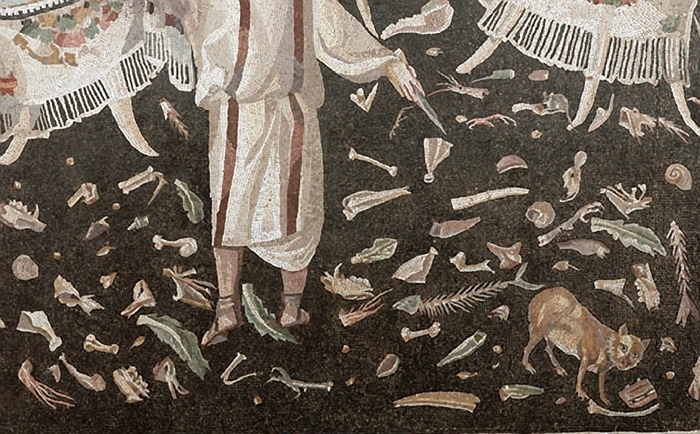 Certainly this looks like a successful Roman 5th century CE feast when all the bones line the floor. The closeness of killing and eating as a requirement to bind divine and human, transcendent and immanent, occurs early in Western literature. 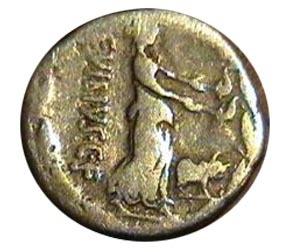 Let’s look at two Homeric pig feasts. the spit-racks; and he sprinkled them with salt. Lines from the famous Embassy to Achilles in the Iliad, where Ajax, Odysseus, Phoenix attempt to convince Achilles to rejoin the war after Agamemnon’s insults. Before any talk can start, a meal featuring the roasted backbones of pigs and other animals are washed down with wine. Then, from the Odyssey, a smaller dinner table. And he went to the sties where the swine were penned. He picked our two and slaughtered them, and put them on spits. Sprinkling the pork with white barley meal. Men who have no fear of the gods and feel no pity. 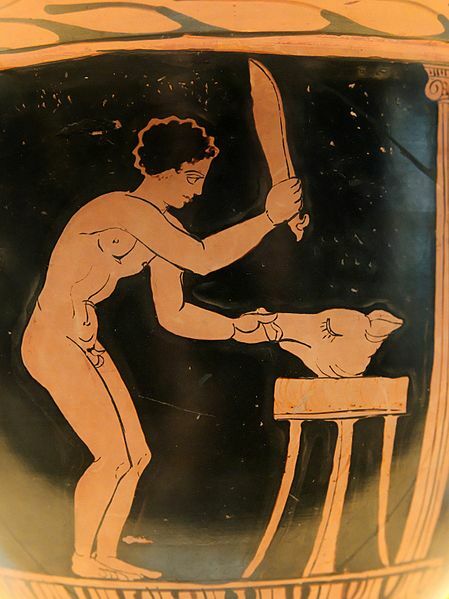 Here the suckling pig is not the prized dish, though a transformation of the “young porker” into something beneficient occurs with the offering of friendship to a stranger, Odysseus in disguise. The question of why we are eating always presents a necessary and life-sustaining decision. Not only feeding our bodies, but our souls as well. A feast may present a moment of gluttony as with the suitors, but usually rules of preparation and eating keep us at the moral table, though at times as in Pan’s Labyrinth, the forbidden food may be exactly what fate orders. Negotiating life and death, oven and table, I’ll end with a favorite scene. Bon Appétit!